Rosberg won the pole position by setting the fastest lap in qualifying and maintained his advantage when the race started. Rosberg held a one-second advantage over Hamilton by the time of his first pit stop at the end of the seventh lap. Nico Hülkenberg became the leader after Hamilton made his own pit stop on lap eight and held it until he was overtaken by Rosberg six laps later. Hamilton regained the lead upon Rosberg's second pit stop twelve laps later but did not emerge in the lead after spinning at turn four during the additional lap he spent on the track. Despite blistered front tyres, Hamilton remained within reach of Rosberg by the time of the final pit stop cycle, and after it ended, Rosberg remained narrowly in front of Hamilton. Rosberg withstood pressure from his teammate for the rest of the race to secure the victory. The 2014 Brazilian Grand Prix was the 18th (and penultimate) of 19 scheduled rounds of the 2014 Formula One season and the 42nd running of the event as part of the Formula One World Championship. It was held on 9 November at the 4.309 km (2.677 mi) 15-turn Autódromo José Carlos Pace in São Paulo. As they were at the preceding United States Grand Prix the previous week, Caterham and Marussia were again granted dispensation from attending this event by the owner of the sport's commercial rights Bernie Ecclestone due to their ongoing financial struggles coupled with the high cost of travel to the western hemisphere and the one-week gap between the United States and Brazilian Grand Prix. The drag reduction system (DRS) had two activation zones for the race: one was on the straight linking turns three and four and the second was on the straight linking the final and first corners. The event's official name was the Formula 1 Grande Prêmio Petrobras do Brasil 2014. Before the race, Mercedes driver Lewis Hamilton led the Drivers' Championship with 316 points, 24 ahead of teammate Nico Rosberg in second and Daniel Ricciardo third. Valtteri Bottas was fourth on 155 points, six ahead of Sebastian Vettel in the battle for the position. While the Drivers' Championship had not been won, the Constructors' Championship had been secured by Mercedes in the Russian Grand Prix. Red Bull had ensured that they would remain in second place for the rest of the season, while Williams (238 points) and Ferrari (196) contended for third place and McLaren rounded out the top five. With the introduction of double points for the season-closing Abu Dhabi Grand Prix, the Drivers' Championship could not be secured in Brazil as even if Hamilton won and Rosberg failed to score, the latter would still be in mathematical contention by being 49 points behind Hamilton. Over the summer months, the track was resurfaced in an effort to reduce its bumpiness and the pit lane was re-profiled with the entry brought forward from the Arquibancadas corner to move it off the racing line and a chicane added to the pit lane to further slow cars entering the pit lane following a series of heavy accidents in national races. The pit lane exit was moved further away from the circuit to allow for a run-off area on the outside of turn two. In addition, in response to the incident suffered by Jules Bianchi during the Japanese Grand Prix, procedures relating to the location of a tractor crane serving the Senna "S" chicane were also altered. Pirelli originally nominated the orange-banded Hard and white-banded Medium tyres, as it has for the event since 2012. However, following the Russian Grand Prix one month prior, many drivers criticised the low level of grip and wear shown on the new tarmac of the Sochi Autodrom. Since the Autódromo José Carlos Pace was completely repaved, there was concern that the hard compound would be "very dangerous". Along with unanimous agreement from all eleven teams,[n 1] Pirelli ultimately decided to bring the Medium and yellow-banded Soft tyres to Brazil. During practice, the sport's governing body, the Fédération Internationale de l'Automobile re-tested its Virtual Safety Car system, which was proposed for 2015 to better deal with race track emergencies, following the incident suffered by Bianchi during the Japanese Grand Prix. Changes made to this system, relative to the version first tested in the preceding United States race, satisfied the drivers. There were three driver changes for the first practice session. Deutsche Tourenwagen Masters racer Daniel Juncadella replaced Sergio Pérez at Force India for the third time in the season, while GP2 Series competitor Felipe Nasr participated in Bottas's car, and the Formula Three European Championship third-place finisher Max Verstappen drove Jean-Éric Vergne's Toro Rosso. Three practice sessions—two on Friday and a third on Saturday—were held before the Sunday race. The Friday morning and afternoon sessions lasted ninety minutes each; the third, one-hour session was held on Saturday morning. Rosberg was fastest in the first practice session, which took place in dry and warm weather conditions, with a lap of 1 minute and 12.764 seconds, two-tenths of a second faster than teammate Hamilton in second and Daniil Kvyat in third. Fernando Alonso was fourth-fastest, and Felipe Massa placed fifth. Verstappen, Pastor Maldonado, Kimi Räikkönen, Kevin Magnussen and Ricciardo rounded out the session's top ten drivers. During the session, where drivers struggled with grip on the resurfaced track, Juncadella spun at turn six, and later lost control of his car's rear-end, crashing heavily into the turn eight barrier, damaging his car's nose cone and suspension, and the session was red flagged. The crash resulted in Force India replacing several engine hydraulic components following a heat soak and Pérez missed the second session. Jenson Button was unable to take part when he stopped at the pit lane entry with an energy recovery system failure. Esteban Gutiérrez was also not able to record a lap time upon suffering engine electrical issues. In the second practice session, Rosberg recorded the fastest time of the day with a lap of 1 minute and 12.123 seconds; teammate Hamilton was second-fastest having set the fastest second sector time of any other driver and Räikkönen was third. Ricciardo was fourth-fastest, ahead of Williams drivers Bottas and Massa. Alonso, Kvyat, Vettel and Magnussen followed in the top ten. The session was disrupted three times: firstly for Vergne who stopped on track at turn four when his engine had a sudden loss of power after 11 minutes. The second stoppage was caused by Alonso when his engine caught fire and stopped on the straight between turns three and four. He vacated his Ferrari, ran behind a barrier, and took a fire extinguisher to stop the blaze before marshals could reach his car. Gutiérrez triggered the final red flag period when his car stopped with an energy recovery system failure with 13 minutes remaining. The final practice session was held in dry but overcast weather conditions and saw Rosberg complete a free practice sweep with the fastest time of 1 minute and 10.446 seconds on soft compound tyres. Hamilton was second-fastest and later spun under braking for the Senna S chicane. Hamilton was later delayed by a Lotus car while on a fast lap. The two Williams drivers were third and fourth (with Massa ahead of Bottas); Ricciardo was fifth and Button sixth. Räikkönen was seventh-fastest, Alonso eighth, Magnussen ninth and Kvyat rounded out the top ten ahead of qualifying. Nico Rosberg won the first FIA Pole Trophy after securing the pole position and surpassed Rubens Barrichello's ten-year qualifying track record. Saturday afternoon's qualifying session was divided into three parts. The first part ran for 18 minutes, eliminating cars that finished the session 15th or below. The 107% rule was in effect, requiring drivers to reach a time within 107% of the quickest lap to qualify. The second part of the qualifying session lasted 15 minutes, eliminating cars that finished 11th to 14th. The final qualifying session determined pole position to tenth. Cars in the final qualifying session were not allowed to change tyres, using the tyres with which they set their quickest lap times in the prior session. Rosberg was fastest in all three qualifying sessions, taking his tenth pole position of the season, and the 14th of his career, with a time of 1 minute and 10.023 seconds, surpassing the previous pole lap record set by Rubens Barrichello in the 2004 race by six-tenths of a second. This meant he became the first winner of the FIA Pole Trophy as Hamilton could not surpass him with one race left. He was joined on the grid's front row by Hamilton who set a lap 0.033 seconds slower and lost time by entering turn ten too fast, causing him to lose control of his car's rear. Massa qualified in third and was delayed by slower traffic on his final timed lap and locked his tyres at the Senna S chicane, forcing him to abort his final attempt. Massa was further hindered with fuel pressure problems, shutting down his engine. Bottas also aborted his final qualifying lap after locking his tyres three times and was restricted to fourth. Button and Vettel took fifth and sixth. Button was able to secure the position on his first timed lap but did not improve on the following attempt. It allowed Vettel to challenge him but was 0.080 seconds slower than Button on his second timed lap. Magnussen did not feel the soft compound tyres were working in his favour and was unable to improve on his fastest time, restricting him to seventh. The two Ferrari cars were eighth and tenth (with Alonso ahead of Räikkönen); they were separated by Ricciardo, who made small fine-tuning adjustments to his car before qualifying and believed it affected his Red Bull's balance. Gutiérrez, considered as "one of the standout performers" of qualifying, was the fastest driver not to advance into the final session; his best lap of one minute and 11.591 seconds was nearly 1.3 seconds slower than Rosberg's pace in the second session. Nico Hülkenberg had difficulty finding a rhythm and took 12th. He was ahead of Adrian Sutil in the slower of the two Sauber cars. Kvyat qualified in 14th after electing not to record a lap time in the second part of qualifying and was demoted ten places on the starting grid after carrying over an engine penalty from the United States Grand Prix. As a result, Romain Grosjean inherited the position, after his team made overnight adjustments to his car. Vergne had difficulty in driving and an incorrect set-up qualified him in 15th. Pérez originally took 16th but a seven-place grid penalty was applied after causing an avoidable accident with Sutil in the previous race and Maldonado inherited the place. ^1 — Daniil Kvyat received a seven-place grid penalty to complete the ten-place penalty that he received at the previous race. ^2 — Sergio Pérez received a seven-place grid penalty for causing an avoidable accident in the previous race. The race began at 14:00 Brasilia Time (UTC-02:00). Weather conditions at the start of the race were dry and sunny with an air temperature between 23 to 24 °C (73 to 75 °F) and a track temperature ranging from 46 to 50 °C (115 to 122 °F); forecasts heading into the race predicted rain for Sunday but this had not materialised. Sutil started from the pit lane after his mechanics reconfigured his car's cooling system. The first ten starters began the race on the soft compound tyres with four drivers electing to start on the medium compound tyres. When the race began from its standing start, Rosberg made a good start and maintained his pole position advantage heading into the Senna S chicane. Bottas made a slow getaway but recovered to retain fourth place. Heading into the Curva do Sol turn, Vettel over-committed in the braking zone and ran wide while defending from Magnussen. By doing so, Magnussen and Alonso immediately took advantage and passed Vettel to demote him to eighth behind teammate Ricciardo. Kvyat made the best start of the field, moving from 17th to 13th by the end of the first lap, while Sutil lost five positions over the same distance. At the end of the first lap, Rosberg led Hamilton by 0.8 seconds, who was followed in turn by, Massa, Bottas, Button, Magnussen, Alonso, Ricciardo and Gutiérrez. Felipe Massa finished third despite a five-second time penalty for speeding in the pit lane. Rosberg began to pull away from Hamilton, opening up a 1.2 second advantage over his teammate while Massa was a further one second adrift of Hamilton. Further down the field, Räikkönen passed Hülkenberg to move into eleventh position. Ricciardo pressured teammate Vettel on the start of the third lap, feigning an overtaking manoeuvre heading into the Senna S chicane but was not close enough to complete the pass. Massa was the first driver to have severe blistering on the soft compound tyres and was the first of the leading drivers to make a pit stop at the end of lap five for the change to the medium compound tyres, with Vettel, Bottas and Button making similar stops on the following lap. Rosberg held a one-second lead over Hamilton and made his first pit stop from the lead at the end of the seventh lap. Hamilton had been more conservative on his tyres and went half a second faster in clear air. The medium compound tyres took more than one lap to get optimum temperature. Massa was handed a five-second penalty after he was observed speeding in the pit lane, and Hamilton made his pit stop from the lead at the conclusion of lap eight and came out narrowly behind teammate Rosberg. With Hamilton's and Rosberg's pit stops completed, Hülkenberg and Kvyat were now the first two drivers at the front of the field, followed by Grosjean. Rosberg was impeded by slower traffic which gave the potential for Hamilton to attack his teammate. Rosberg was protected from being overtaken by Hamilton on the main straight because he used DRS to defend himself since he was close behind Grosjean. Both drivers were able to pass the Lotus car. Rosberg drew nearer to Kvyat and passed him for second on lap 12. On the same lap, Button overtook Sutil for eighth place. Hamilton was instructed by his team to manage the temperature in his right-rear tyre and lost more time to Rosberg after following Kvyat in the track's middle sector. Kvyat allowed Hamilton to pass him going into the Senna S chicane while Hülkenberg had Rosberg close behind. Hülkenberg reported a blistered front-right tyre to his team and lost the lead to Rosberg who passed him driving into the Senna S chicane at the beginning of the 14th lap. Massa got ahead of Grosjean and Bottas got ahead of the latter at the Senna S chicane to move into sixth place on lap 15. With his front tyres blistered, Hülkenberg was passed by Hamilton who used his DRS going into the Senna S chicane on the following lap. Massa drew closer to Kvyat and passed him heading into the Senna chicane for fourth place on lap 17 while Alonso overtook Sutil at the same turn to move into tenth on that lap. At the same time, Hülkenberg made his pit stop and rejoined the track in 15th position. Hamilton's right-front tyre was blistered but this did not hinder him significantly upon as he set a new fastest lap of the race to be 2.1 seconds behind Rosberg at the start of lap 20. The reduction of the lead was down to Rosberg being aware of not causing a large amount of stress on his tyres and partly down to Hamilton's superior pace. The two drivers pulled away from Massa. Button drove closely behind Bottas and used his DRS to establish an advantage over the close group of cars consisting of teammate Magnussen, Vettel, Alonso and Ricciardo. Magnussen steered to the left of Grosjean and passed him for sixth on lap 23. Alonso attempted to pass Grosjean around the outside heading into the Senna chicane on the next lap but Grosjean defended his position. Alonso tried again on the main straight and passed Grosjean before turning into the Descida do Lago turn for seventh. Vettel also moved in front of Grojean at the corner. Massa served his five-second time penalty on the 26th lap, and upon taking it, had new tyres fitted on his car. Rosberg made his second pit stop on the same lap, handing the lead back to Hamilton. Bottas also made a pit stop but was heavily delayed after his seat belt had undone itself and his team made adjustments to it, allowing Button into fourth and Bottas rejoined in 12th place. Hamilton began to lap faster than any other driver in an effort to move into the lead upon making his pit stop. He was asked by his team on lap 28 to make an energy recover switch to increase his car's harvesting rate but had not made a forward brake bias adjustment. When Hamilton applied his brakes for the Descida do Lado turn, his rear tyre locked and attempted to regain control of his oversteering car but went off into the corner's run-off area. Hamilton returned to the track but lost seven seconds of time. Hamilton made his pit stop on the same lap and emerged in second, 7.4 seconds behind teammate Rosberg. Button closed up to Kvyat and feigned a passing move on the latter but waited until the main straight to overtake Kvyat with DRS assistance heading into the Senna chicane on lap 30. Hamilton reduced the gap to teammate Rosberg to five seconds by the 35th lap despite running on blistered rear tyres. Räikkönen made a pit stop from third on the same lap but lost time after the front jack was lowered before his right-front tyre was installed and emerged in 13th behind Grosjean. Lewis Hamilton finished second to allow the title to be decided at the season-ending Abu Dhabi Grand Prix. Vettel got ahead of Kvyat at the Senna chicane for fifth on lap 37. Ricciardo's front-left suspension began to move unsteadily on the main straight on lap 39, and entering the Senna chicane, his car veered right. Ricciardo limped back to the pit lane to retire, ending his fifteen-race finishing streak, extending back to the Malaysian Grand Prix. Hülkenberg attacked Bottas entering the Senna chicane and passed Bottas for eighth after forcing him onto the turn's run-off area on lap 42. Räikkönen immediately took advantage and attacked Bottas who defended at the outside of the Descida do Lago corner before the Ferrari got ahead of Bottas who went wide leaving the turn. Bottas made a pit stop on lap 44 which proved problematic: one of his mechanics struggled to make a front wing adjustment and Bottas emerged in 16th place. Magnussen was suffering worse tyre degradation than teammate Button and came under attack from Alonso on lap 45, who moved to the outside lane heading towards the Senna chicane but was unable to pass. The battle continued through the following corners and Magnussen went defensive driving into the Descida do Lago turn which compromised his exit and Alonso overtook him around the inside of turn five. Hamilton closed the gap to Rosberg to be 1.9 seconds behind his teammate by the start of lap 50. Rosberg made his third (and final) pit stop from the lead on the same lap. Hamilton pushed hard after Rosberg's pit stop but was delayed by slower traffic and therefore emerged narrowly behind his teammate after making his own stop. Massa and Button made pit stops on the same lap and both drivers left the pit lane in fifth and sixth places. Button had closed up to Massa after the latter drove into the incorrect pit box. Hülkenberg was promoted into third but lost the position to Massa heading into the Senna chicane on the 54th lap. Hamilton attacked Rosberg, who responded by going faster than his teammate in the middle sector but Hamilton was able to remain close with DRS assistance on the main straights. The duo pulled away from Massa and Räikkönen. Rosberg and Hamilton came across slower traffic but it did not affect them greatly enough to cause hindrance. On lap 61, Räikkönen—on 25-lap worn tyres—was pressured by Button for fourth heading into the Senna chicane but Räikkönen resisted the manoeuvre. Button held the racing line and went alongside Räikkönen on the back straight before eventually passing him around the outside at the Descida do Lago turn. Räikkönen lost momentum at the corner and was passed by Vettel. Alonso began to battle teammate Räikkönen who placed his car in a defensive position for the next few laps. Grosjean stopped on track near a fire marshal with smoke bellowing from his engine on lap 65 and became the race's second (and final) retirement. Hülkenberg passed Magnussen for eighth on lap 68, while Räikkönen lost traction in his tyres at the bottom of the hill heading towards the Senna cichane, allowing teammate Alonso through for sixth on the same lap. Hamilton pressured Rosberg and reduced the time deficit to his teammate to be 0.8 seconds behind at the start of the 71st (and final) lap, but Hamilton could not get close enough to affect an overtaking manoeuvre and Rosberg crossed the start/finish line first to win the race. Massa finished third, with Button in fourth and Vettel fifth. Alonso took sixth ahead of teammate Räikkönen, Hülkenberg was eighth, and Magnussen secured ninth. Bottas fended off an challenge from Kvyat in the final laps to secure the final points-scoring position of tenth. Maldonado, Vergne, Gutiérrez, Pérez and Sutil were the last of the classified finishers. It was Rosberg's fifth victory of the season, his first in Brazil, and the eighth of his career. Mercedes's one-two finish was their eleventh of the season, braking the previous record held by McLaren since 1988 with Alain Prost and Ayrton Senna. It was also the team's 15th victory of the year, equalling the record jointly held by McLaren and Ferrari. There were seven lead changes in the race: three drivers reached the front of the field. Rosberg led four times for a total of 59 laps, more than any other driver. At the podium interviews, conducted by three-time World Champion Nelson Piquet, Rosberg declared his happiness over his race weekend sweep, having been able to feel comfortable to attack with his Mercedes. Hamilton said despite his turn four spin, it had been "an amazing race" and praised his team for the work they put in and enjoyed his battle with Rosberg. Massa stated that he was "grateful" for the pace of his car and declared how he happy he was for his home event. In the later press conference, Rosberg said it was important for him to improve after the American race, and was confident that he could control the gap to Hamilton and ensure he did not come into contention to battle for the win. When asked if his spin prevented him from winning the race, Hamilton replied that he felt it did and stated that he was at fault. He felt the team's record-breaking race was "absolutely incredible" and that it had been an "unbelievable job" by Mercedes. Massa revealed he thought his chances of finishing on the podium were diminished with his five-second time penalty but was not worried about his parking in the incorrect pit stall, He felt confident about continuing his strong form into the season-closing Abu Dhabi Grand Prix, hoping his car would contend for a podium position. Vettel explained his loss of ground at the start of the race triggered memories of his first lap collision with Bruno Senna in the 2012 race, saying he felt Red Bull would be stronger against McLaren at the start but that it was highly competitive and was hoping to possibly finish in a higher position. Nevertheless, he was happy with his sixth-place result. The Head of Vehicle Performance for the Williams team Rob Smedley stated he was angry with himself for not preventing Massa from driving through the McLaren pit stall after Williams switched garage positions for the race and exchanged words afterwards. He felt it should have been given more consideration and given advance warning. However he reserved praise for his team for salvaging one additional point from Bottas and described the Williams team's race as a "character building" event, something he was taught at Ferrari by their technical director Ross Brawn. Bottas revealed he had severe left-rear tyre graining on his final stint which caused him to slide massively and drop positions: "I was managing a lot at the beginning and then could just avoid [Daniil] Kvyat from overtaking. At one point there was some debris in the rear wing [as well], a tear off or something. [As I said] it was just not my day." Following Button's fourth-place finish, which was the fifth time in the season that he finished in the top four, he stated he did not compete to attempt to prove anything but was in the sport "to do my job and my job is to do the best job I can for myself and for the team and that's exactly what I did." However, he was delighted at his battle with the Williams team, saying, "It was a lot of fun. And then the battle with Kimi Raikkonen, going past him was mega – I really enjoyed that. We're not the best of friends but we battle hard but clean." Alonso did not feel frustrated towards teammate Räikkönen over the pair's late-race battle for sixth place: "The most important thing was not the battle with him, it was the battle with the other teams and we got some good points for Ferrari today. Even if I could have overtaken Kimi a little quicker I had to save a lot of fuel in the last couple of laps so a battle with Sebastian was never a possibility." Räikkönen dismissed the battle as "normal racing" and felt the duel had not hindered his team because it made no difference for him or Ferrari, and no matter where he finished, the team would accumulate the same amount of points. Rosberg was praised by the press. Andrew Benson of BBC Sport stating his weekend was "copybook" and that he required it to "re-establish his position as a credible championship contender" to many people. L'Équipe wrote that Roserg "demonstrated above all that he knew how to let the past, and his recent disappointments, behind him. He is psychologically ready to face his rival and lead the hard life until the last round of the last Grand Prix." The Daily Telegraph's Formula One correspondent Daniel Johnson described Rosberg's performance as "the race of his life under relentless pressure" and called his victory "the finest of his career." Writing for The Independent, David Tremayne stated Rosberg had "finally avenged himself" on teammate Hamilton with the victory and that his chances of the championship remained realistic by showing he proved he could resist pressure. El País stated Rosberg's duel with teammate Hamilton was "important" because of him having to observe his championship rival win the previous five rounds and it was "a moral victory that can have an impact at the decisive moment." The result meant Rosberg reduced Hamilton's Drivers' Championship lead by seven points to 17 behind his teammate. Despite his retirement, Ricciardo had secured third place in the championship as no other driver would be able to surpass his points total in the season's one remaining race. Vettel's fifth-place finish enabled him to move into fourth position on 159 points and was two points in front of fifth-placed Alonso. Mercedes further extended their unassailable lead in the Constructors' Championship to 278 points ahead of Red Bull. Williams and Ferrari remained in third and fourth places with 254 and 210 points and McLaren maintained fifth on 161 points with one race left in the season. Despite his lead, Hamilton stated that he would take "zero comfort" for the season's final race: "There are 50 points to gain. The last race, you never know whats going to happen, so I'm going there to win." ^ Caterham and Marussia's agreement was required, as they had not yet entered administration when the decision to switch tyre compounds was made. ^ a b c d "2014 Brazilian Grand Prix – Preview". Fédération Internationale de l'Automobile. 5 November 2014. Archived from the original on 6 May 2017. Retrieved 9 May 2017. ^ Weaver, Paul (25 October 2014). "Marussia join Caterham in missing F1 US GP, confirms Bernie Ecclestone". The Guardian. Archived from the original on 14 October 2015. Retrieved 9 May 2017. ^ "Formula 1 Grande Prêmio Petrobras do Brasil 2014". Formula1.com. Archived from the original on 20 September 2014. Retrieved 12 May 2017. ^ a b c d e f g "Classifications". Fédération Internationale de l'Automobile. Archived from the original on 27 November 2014. Retrieved 23 July 2016. ^ "Rosberg takes pole in Brazil". CNN. 8 November 2014. Archived from the original on 5 December 2014. Retrieved 10 May 2017. ^ Collantine, Keith (6 November 2014). "Massa endorses Interlagos safety changes". F1 Fanatic. Archived from the original on 7 November 2014. Retrieved 7 November 2014. ^ "Brazilian Grand Prix organizers move tractor after Bianchi crash". Autoweek. 6 November 2014. Archived from the original on 27 December 2014. Retrieved 9 May 2017. ^ Baldwin, Alan (14 October 2014). "Pirelli tyre choice for Brazil unacceptable: Massa". Reuters. Archived from the original on 19 January 2016. Retrieved 4 November 2014. ^ a b Esler, William (17 October 2014). "Pirelli have opted to change their Brazilian GP tyre choice to softer compounds". Sky Sports F1. Archived from the original on 14 November 2015. Retrieved 9 May 2017. ^ Noble, Jonathan (5 November 2014). "F1's virtual safety car system to be tweaked for Brazilian GP trial". Autosport. Archived from the original on 27 June 2015. Retrieved 9 May 2017. ^ "Juncadella gets practice outing in Brazil". GPUpdate. 5 November 2014. Archived from the original on 15 March 2015. Retrieved 9 May 2017. ^ a b c d Roberts, James (7 November 2014). "Brazilian GP: Nico Rosberg quickest in opening practice". Autosport. Archived from the original on 7 November 2014. Retrieved 9 May 2017. ^ a b Benson, Andrew (7 November 2014). "Nico Rosberg fastest in Brazilian GP first practice". BBC Sport. Archived from the original on 11 September 2016. Retrieved 10 May 2017. ^ a b Esler, William (7 November 2014). "2014 Brazilian GP Practice Two: Nico Rosberg maintains advantage at Interlagos". Sky Sports F1. Retrieved 10 May 2017. ^ a b Straw, Edd (7 November 2014). "Brazilian GP: Nico Rosberg stays on top in second practice". Autosport. Archived from the original on 7 November 2014. Retrieved 10 May 2017. ^ Roberts, James (8 November 2014). "Brazilian GP: Nico Rosberg completes clean sweep in practice". Autosport. Archived from the original on 8 November 2014. Retrieved 10 May 2017. ^ a b c "Nico Rosberg on F1 pole in Brazil". The Sydney Morning Herald. Agence France-Presse. 8 November 2014. Archived from the original on 13 January 2015. Retrieved 10 May 2017. ^ a b c d Esler, William (8 November 2014). "2014 Brazilian Grand Prix qualifying: Nico Rosberg edges Lewis Hamilton to pole". Sky Sports F1. Archived from the original on 11 September 2015. Retrieved 10 May 2017. ^ Anderson, Ben (8 November 2014). "Brazilian GP: Fuel pressure glitch hurt Felipe Massa in qualifying". Autosport. Archived from the original on 12 January 2018. Retrieved 12 January 2018. ^ Medland, Chris (8 November 2014). "F1 Brazilian Grand Prix: Bottas doubts pole was within reach". crash.net. Archived from the original on 6 December 2014. Retrieved 10 May 2017. ^ a b Straw, Edd (8 November 2014). "Brazilian GP: Nico Rosberg beats Lewis Hamilton to pole". Autosport. Archived from the original on 8 November 2014. Retrieved 10 May 2017. ^ a b c "Who said what after qualifying for the Brazilian Grand Prix". ESPN. 8 November 2014. Archived from the original on 12 May 2017. Retrieved 10 May 2017. ^ a b c d e f "2014 Brazilian Grand Prix – Qualifying results". Formula1.com. Formula One World Championship Limited. 8 November 2014. Archived from the original on 26 February 2015. Retrieved 9 November 2014. ^ "Ricciardo suspects 'fine tuning' cost him pace". ESPN. 8 November 2014. Archived from the original on 7 January 2015. Retrieved 10 May 2017. ^ "GP Brasilien in Interlagos / Rennen". motorsport-total.com (in German). Archived from the original on 11 November 2014. Retrieved 10 May 2017. ^ a b c d e f g h i j k l m Hughes, Mark (10 November 2014). "2014 Brazilian GP report". Motor Sport. Archived from the original on 24 November 2014. Retrieved 10 May 2017. ^ a b c d e f g h i j k l m n o p q r s t u Beer, Matt; Freeman, Glenn (9 November 2014). "As it happened: Sunday – Brazilian Grand Prix". Autosport. Archived from the original on 12 November 2014. Retrieved 10 May 2017. ^ a b "2014 Brazilian Grand Prix – Lap Chart". Fédération Internationale de l'Automobile. 9 November 2014. Archived from the original on 14 May 2016. Retrieved 10 May 2017. ^ a b c d e f g h i j k l m n o p Barretto, Lawrence (9 November 2014). "Brazilian GP as it happened". BBC Sport. Archived from the original on 12 November 2014. Retrieved 10 May 2017. ^ a b c d e f g Hodges, Vicki (9 November 2014). "Brazil Grand Prix 2014, Formula One: as it happened". The Sunday Telegraph. Archived from the original on 19 November 2015. Retrieved 10 May 2017. ^ a b "Daniel Ricciardo retires from Brazilian F1 Grand Prix with suspension failure". Fox Sports Australia. 9 November 2014. Archived from the original on 12 May 2017. Retrieved 12 May 2017. ^ a b "Rosberg takes win in Brazilian GP". Special Broadcasting Service. 9 November 2014. Archived from the original on 12 May 2017. Retrieved 12 May 2017. ^ Azzoni, Tales (9 November 2014). "Rosberg gains on Hamilton with F1 Brazilian Grand Prix win". Toronto Star. Associated Press. Archived from the original on 12 May 2017. Retrieved 12 May 2017. ^ a b "2014 Petrobras Grand Prix of Brazil". Racing-Reference. Archived from the original on 12 May 2017. Retrieved 9 May 2017. ^ a b c d e f "Brazilian GP: Post-race press conference". Autosport. 9 November 2014. Archived from the original on 10 November 2014. Retrieved 12 May 2017. ^ "Vettel had memories of 2012 clash". Eurosport. 9 November 2014. Archived from the original on 12 May 2017. Retrieved 12 May 2017. ^ Anderson, Ben (9 November 2014). "Williams's Smedley upset with self over Massa's Brazil GP pit error". Autosport. Archived from the original on 24 March 2015. Retrieved 12 May 2017. ^ Wilkins, Rob (9 November 2014). "F1 Brazilian Grand Prix: Loose seatbelt and graining costs Bottas". crash.net. Archived from the original on 21 August 2015. Retrieved 12 May 2017. ^ a b Weaver, Paul (10 November 2014). "Jenson Button says he has nothing to prove after F1 fourth place in Brazil". The Guardian. Archived from the original on 31 January 2016. Retrieved 12 May 2017. ^ a b Anderson, Ben (9 November 2014). "Brazilian GP: 'Zero frustration' over Raikkonen battle says Alonso". Autosport. Archived from the original on 10 November 2014. Retrieved 12 May 2017. ^ Benson, Andrew (10 November 2014). 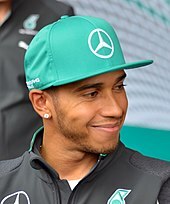 "Lewis Hamilton v Nico Rosberg: German win sets up anxious finale". BBC Sport. Archived from the original on 11 November 2014. Retrieved 30 June 2017. ^ Bosset, Fabrice (9 November 2014). "F1 GP du Brésil – Rosberg a tenu bon". L'Équipe (in French). Archived from the original on 11 November 2014. Retrieved 30 June 2017. ^ Johnson, Daniel (9 November 2014). "Brazil Grand Prix 2014: Nico Rosberg holds off team-mate Lewis Hamilton to set up dramatic season finale". The Daily Telegraph. Archived from the original on 11 November 2014. Retrieved 30 June 2017. ^ Tremayne, David (9 November 2014). "F1 Brazilian Grand Prix 2014: Nico Rosberg ends Lewis Hamilton run but Briton remains in control of race for Drivers' Championship". The Independent. Archived from the original on 30 June 2017. Retrieved 30 June 2017. ^ Serras, Manel (9 November 2014). "Rosberg vuelve a ganar". El País (in Spanish). Archived from the original on 23 November 2014. Retrieved 1 July 2017. ^ Benson, Andrew (9 November 2014). "Lewis Hamilton take no comfort from lead over Nico Rosberg". BBC Sport. Archived from the original on 11 November 2014. Retrieved 12 May 2017. ^ a b "Brazil 2014 - Championship • STATS F1". www.statsf1.com. Retrieved 13 March 2019. This page was last edited on 8 April 2019, at 18:38 (UTC).